Tortuga Tidings has been through a whirlwind of events the past few weeks. First a week at Coverings, the international tile and stone show, in Orlando, then straight to a rollicking time at the Miami Rum Renaissance, and then the following weekend at the Indie Craft Bazaar in Fort Lauderdale. Although very different all three shows were abundant with amazing people and products. 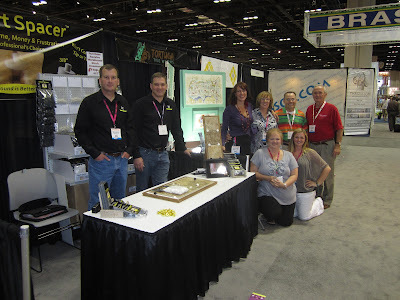 In this week's post I would like to specifically draw attention to a few of the highlights from our week at Coverings. We exhibited in a row of some really creative people. The friendly and ingenious folks from Decos on Demand, Heka Products and Smart Spacers made our week an informative and fun experience. Decos on Demand have created a solution for that fickle mindset that stops people from permanently installing decorative tiles. Their solution is to install their deco pods in a tile layout and with the aid of a simple magnetic backing, homeowners can change out the accent tiles as their taste vacillates. The metal pods come in several colors to blend in with the grout so the removable tiles look like they are permanently adhered and grouted into the layout. This seems like the perfect thing for Tortuga Tiles! Our other neighbors had products for aiding in installation. I am looking forward to my next batch of mosaics made easier with round spacers that roll as you set the tile and a bucket with a sponge ringer attached. No more fussy spacers that fall over and get stuck in the grout and no more wrist strain! Any DIYer about to take on tile projects should consider all three of these products! While at Coverings I also met and became acquainted with several other artisan tile companies and I will be highlighting them in coming weeks. In particular, Medicine Bluff Studio out of Cincinnati and Red Rock Tile out of Nashville. Additionally, Oscar & Izzy offers tiles with bright retro graphics. If you are fans of Tortuga's Atomic collection, you will probably like these as well. Overall, we at Tortuga Tile Works, had a fulfilling week at Coverings, meeting and connecting with other manufacturers as well as distributors and design professionals. We look forward to embracing new developments in the tile community and the design world and will continue to pass along our finds.